Could transporting electricity using plastic water pipes be feasible? Water conducts electricity (and can also transport light), why aren't we transporting electricity using plastic water pipes instead of using copper cables? If you somehow could use water for optical internet, that'd be a 3-in-1 solution. Mikael Dúi Bolinder is a new contributor to this site. Take care in asking for clarification, commenting, and answering. Check out our Code of Conduct. Water, especially pure water, is a rather poor conductor of electricity. 5–50 mS/m for tap water vs. more like 6E+7 S/m for copper. That's about 10 orders of magnitude, so for the same losses as a 4 mm diameter AWG 6 wire your pipe would have to be 16,000 km in diameter, which would make plumbing somewhat inconvenient. You'd need a return conductor too. That said, there are times when water (including groundwater) can be used to conduct electricity for transmission, at a cost in efficiency. It is not clear if you want to use the 'same' water pipes for drinking/showering and electricity. Because if you would touch water that has too much voltage/current, you die. As soon as you touch the water, there will be (in most circumstances) a connection between the water (110/220 V) and ground (GND). Depending on the resistance more or less current will start to flow: through your body. This high likely is way too much for your heart, or if not, burn wounds will occur. Even if the water would have the voltage of a battery, you don't want to brush your teeth with water having a voltage different from ground. Water has much more electrical resistance than copper, which means it would cause a lot of voltage reduction after long pipes filled with water. If a water pipe (plastic) is broken, dirt can get in, resulting in no or less good conductivity. Pressure is needed to keep the water on such a pressure there are no bubbles. You need multiple pipes, if a pipe breaks the chance is that the water will be 'mixed' resulting in a short cut. A clean copper wire cut will not result directly in a short cut. (meaning only using water to distribute electricity within a single building/house). Water generally doesn't go to the same end location as electricity. You don't need a socket near the toilet flush, and you don't need a tap near your TV set. So this is pointless, except maybe for the kitchen (see comment of dim below). This means that copper is conducting electricity one to ten billion times better than water. A water pipe is thicker than the wires of an electric cable, but this can't compensate such a huge difference. Note that this answer is only about the conductivity. Safety and other aspects haven't even been mentioned. Let us assume that the water is hard (ie with a modest amount of calcium in)... the resistance of the water will be modest, but maybe for short distances it'll "be ok". Once the water gets to your house, you want to remove any potential difference to ground before anyone can touch the water - which would mean that you would have to have a section that is connected to ground and the water. If you do this, the amount of power you can extract from the electricity is limited because you have been required to short your mains to keep it safe... and a load placed across a short isn't going to be able to draw much. Further to this, now that you've had to short the mains, there will be a current continually running - meaning a huge amount of power will be wasted. Passing a current through water will result in electrolysis resulting in a build up of hydrogen and oxygen in the pipe. Highly reactive gasses in a confined area is what results in explosions. It will never work , even if salt water (lossy), or pure dielectric Dk=80 water ( too small capacitance for a long gap between electrodes. Your concept results in a short circuit to the grid with no power transfer. 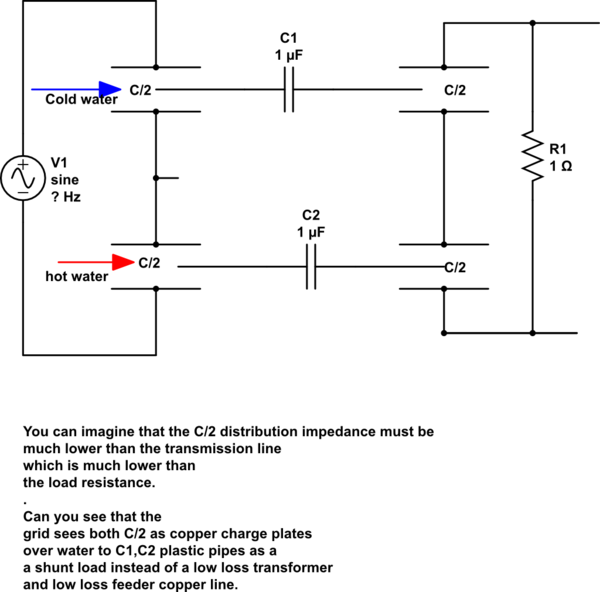 although water has Dk=80 the electrodes in C/2 must be large Area/gap to create a large capacitance. Other answers have already covered why this isn't a good idea. What is a good idea is sharing a large-diameter pipe with other services where possible. There are already projects where sewer pipes have been used for fibre-optic connections, instead of digging a dedicated hole in the ground for your fibre. The fibre is small enough that it won't affect the sewer, there's no disturbance above ground along the route of the cable (which as well as being more convenient also makes it much cheaper), and it's better protected from being dug up accidentally. For example, this project around London. The thicker pipes for drinking water and thicker armoured cables for electrical power are less obvious wins, but could still use this. However most towns and cities already have this infrastructure in place, so there's no reason to change it; and new developments of course are free to lay services wherever they want whilst the diggers are still working. The difference for fibre of course is that it's a new service being retrofitted into the existing infrastructure. Mikael Dúi Bolinder is a new contributor. Be nice, and check out our Code of Conduct. why the electricity has been called the AC power? How could I make a 1kW fan heater consume less electricity?